In gratitude for a large endowment bestowed upon the Research and Education Foundation of the American Head and Neck Society, the Foundation established the Jatin P. Shah Symposium on Clinical Controversies in Head and Neck Surgery in 2006. Since then, the symposium has been a much anticipated and well-regarded panel at every annual meeting. The focus of the symposium follows along the lines of clinical controversies. Professor Jatin P. Shah graduated from the Medical College of Maharaja Sayajirao University in Baroda, India, where he received his basic training in General Surgery. He completed a Fellowship in Surgical Oncology and Head and Neck Surgery at Memorial Sloan Kettering Cancer Center, (MSKCC) and joined its full-time faculty in 1975. He is Professor of Surgery at the Weil Medical College of Cornell University, Chief of the Head and Neck Service and Leader of the Head and Neck Disease Management Team, and holds The Elliott W. Strong Chair in Head and Neck Oncology at Memorial Sloan-Kettering Cancer Center in New York City. Dr Shah is a national and international leader in the field of Head and Neck Surgery, having served as President of The New York Cancer Society, The New York Head and Neck Society, The Society of Head and Neck Surgeons, The North American Skull Base Society and the International Academy of Oral Oncology. He is Founder of The International Federation of Head and Neck Oncologic Societies, (IFHNOS) and serves as it’s Chief Executive Officer (CEO) . He currently serves as Chairman of the AJCC task force on Head and Neck. He has served in varying capacities for The American Board of Surgery and The American College of Surgeons. Professor Shah has been the recipient of numerous awards from various parts of the world, including Honorary Fellowships and Doctorates from the UK, Belgium, Greece and Australia. He was the recipient of the Blokhin Gold medal from Russia and the “Ellis Island Medal of Honor” from the United States. 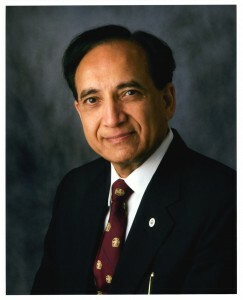 He was named the Most Distinguished Physician in the USA by the American Association of Physicians from India in 2011. He has been listed in the “Best Doctors in America” directories 54 times for the past two decades. Dr. Shah is also an honorary member of several head and neck societies in Europe, Asia, Australia, Africa and South America. He serves on the Editorial and Review Boards of 18 scientific journals and has published over 500 peer-reviewed articles, 67 book chapters and 10 books. His textbook of Head and Neck Surgery and Oncology, now in its 4th Edition, has won numerous prizes for the best published book in Otolaryngology-Head and Neck Surgery. He developed and lead the “IFHNOS World Tour Program”, a global CME program in Head and Neck Surgery and Onclogy, offered in 26 countries over the last six years. He has established an Online fellowship program in Head and Neck Surgery and oncology in collaboration with IFHNOS and MSKCC. As a physician, scientist and professor, Dr. Shah is a much sought after speaker who has delivered over 1,200 scientific presentations including, 68 eponymous lectures and keynote addresses, and visiting professorships in the United States, Canada, United Kingdom, Scotland, Sweden, Belgium, Netherlands, Germany, Italy, Spain, Poland, Czech Republic, Estonia, Russia, Ukraine, Croatia, Albania, Romania, Greece, Turkey, Egypt, UAE, Saudi Arabia, South Africa, India, Pakistan, China, South Korea, Japan, Hong Kong, Taiwan, Singapore, Malaysia, Thailand, Indonesia, Philippines, Australia, New Zealand, Argentina, Brazil, Chile, Peru, Equador, Colombia, Venezula, Panama, and Mexico. In recognition of his outstanding contributions and international leadership in Head and Neck Surgery, Memorial Sloan Kettering Cancer Center, has established The “Jatin Shah Chair in Head and Neck Surgery and Oncology”. The International Federation of Head and Neck Oncologic Societies has established “The Jatin Shah Lecture” at its world congresses, and the American Head and Neck Society has established the “Jatin Shah Symposium” at its annual meeting.